You can look up your order status below and track your order from payment through shipment. Orders can usually be tracked here within 24 hours of placing the order. Sign in to your JPCycles.com account to shop, check out or track your order. Tell us your order number and the name you used for shipping, and we'll look it up. Order Number: Your order number can be found on either your receipt or in your order confirmation email. Shipping Name: The name of the person you shipped the order to. If you're unsure where this is located, there is an example at the link below. We're here to help in any way we can. Chat with one of our top-rated customer service reps or legendary tech support now. 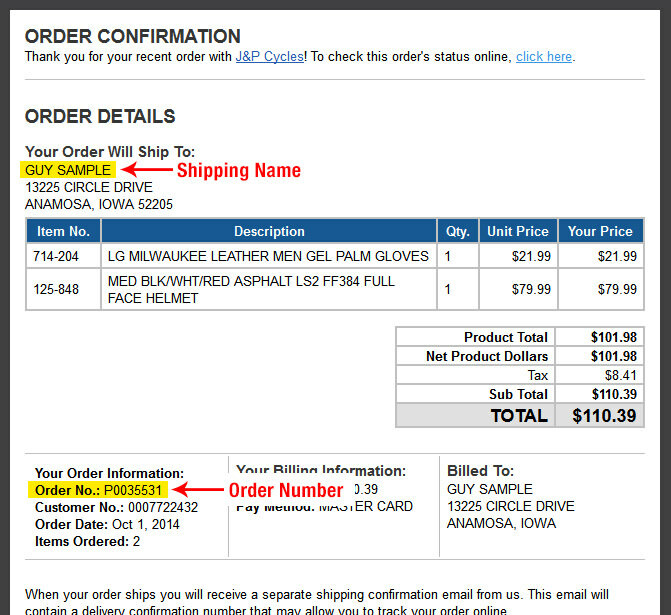 You will find your order number and shipping name in your order confirmation email.